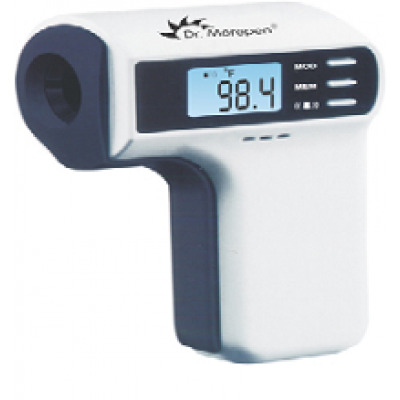 Thermometer Infrared-Dr Morepen Dr.Morepen Thermo Smart Non Contact Infrared Thermometer uses contact less temperature measurement and therefore the body temperature can be measured safely. 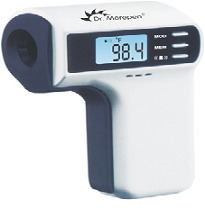 It measures the temperature 2 to 3 cm away from the body which decreases the possible risk of infections that can be caused by thermometers. Digital LCD display with backlight for easy measurement in dark places also Multi-measurement function which measures both body and wide temperature It can store up to 32 results Non contact measurement, no virus Gun- type design which makes it easier to use for those with small hands Power saving: Automatic shut off after a minute Powered by two AAA type alkaline batteries Pocket size Using Thermofinder: Measuring body temperature: Switch the Thermofinder to body temperature measuring mode, and check the body temperature on the temple area from 2 to 3cm distance. Measuring bathing water temperature: Switch the Thermopfinder to daily wide temperature measuring mode, and check the water temperature by approaching towards the water 2 to 3cm close. Be careful not to get water on the Thermofinder. Measuring the nursing bottle: Switch the Thermofinder to daily wide temperature measuring mode, and check the temperature by approaching towards the nursing bottle 2 to 3cm close.